Finally, after a week of cloudy, rainy, and cool weather, the sun and warmth have returned to southern Minnesota. Since last Sunday the St. Peter area has received around .8 inches of rain, which surprisingly isn’t that much considering that it rained everyday up until today; while the precipitation was cool, it was rarely heavy. I overheard many people on campus wishing for April’s weather, and indeed it seems unfortunate that May has mostly been a polar opposite to April, but worry no more. The next ten days’ forecast looks very much like the mid- to late May we’re used to, with plenty of sun and highs in the 70’s and even 80’s. In mid-May, cool, gloomy weather usually means migratory bird fallouts; in other words, birds on their way north tend to get grounded until the weather improves. Sure enough, this week has been a good one for finding migratory birds, with new species showing up everyday. 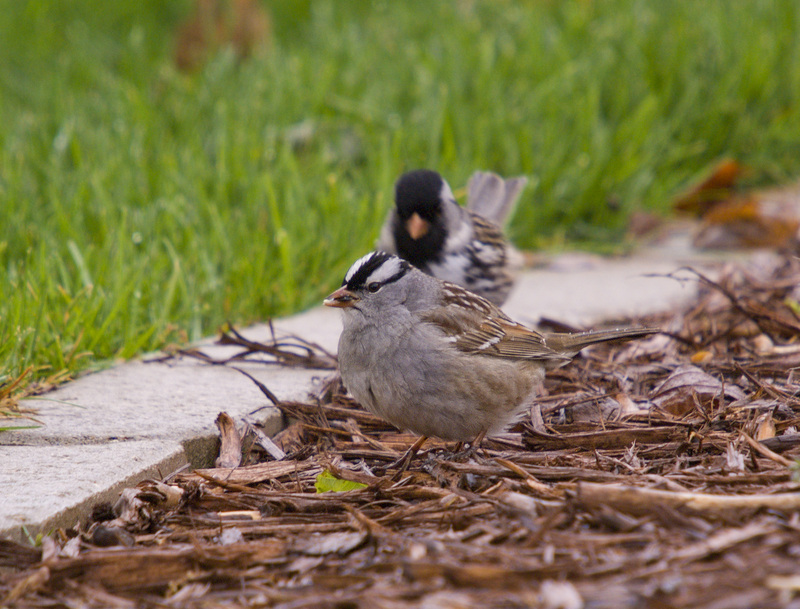 On Tuesday the year’s first Harris’s Sparrows joined several of the White-crowned Sparrows feeding under the Interpretive Center’s feeders; both of these species should be gone within the next few days as they continue their journey into Canada. Ten species of warbler were present in the Arb between Wednesday and Thursday; mid-May is peak time for these colorful gems as they migrate through southern Minnesota. White-crowned Sparrow (with Harris's Sparrow directly behind it) in Bird and Butterfly Garden behind Interpretive Center, 5/11/10. On May 15th, I recorded 25 spieces of birds at our home on the Blue Earth River near Blue Earth, Mn. Ruby- crowned Kingets, Robins, Purple Finch (m/f), N. Orioles (m/f), Yellow Sapsucker (m/f), Nashville Warbler, Yellow-rumped Warbler (m/f),Downy, Red-bellied, Hairy, Red-headed Woodpeckers, Hummingbirds, Canadian Geese on the river, Blue Jay, Mourning Doves, Chipping Sparrow (m/f), Tree Swallows, Rose-breasted Grosbeak (m/f), Nuthatchs, Common Grackles, White-throated Sparrows (m/f),Chickadee, N. Cardinal (m), Flock of Crows, American Goldfinches. I hope this list can be recorded with the tally for the Gustavus birding “Big Day”. Excellent…thanks for the report Jody. Thanks For setting up this opportunity to spend a day birding with my Gustavus friends.